Halen knows the sparks igniting under her fingertips are dangerous. She has spent her entire life trying to quell the tingly feelings that make her destroy things, but now that she is back in Rockaway Beach, where she watched her father drown, the flames have become impossible to tame. Halen is trying to hold on, but when she is thrust into a mysterious new world, the underwater realm of Elosia, she unravels the secrets of her past and can't help but ignite. As she explores Elosia, she realizes her life has been a lie. And when those who have deceived her come to her for help, Halen must choose—walk away or unleash the magick that could destroy them all. "I don't know anything about portals and dimensions. I'm not the demon slayer type, Dax. I'm more the stay at home and read a good book kind of girl. I'm telling you, what I did here is random. I have no control over it." He sounded like Huron. You have a duty to fulfill. Ugh, she wanted to scream. This wasn't as simple as shoving a smile on your face and shifting to a positive attitude. There were huge consequences. "Natalie is dead because of this. Is this what you want? You want me to die too?" Her fist hit the ground and the water from the river rippled. Love what did Dasper know of love? Halen's eyelids slid shut. Love thrived with trust and wilted with lies. Dasper and her mom had severed the threads that tethered her to them. Black birds, from the mermaids' vision, swarmed her thoughts and she let them peck her broken heart. There is nothing unattractive about this book! The cover is stunning, and what lay beneath the cover was just as amazing. I was expecting the best and what I got what better. Tiffany Daune created a world in which the impossible is made real, and what you thought was fact is not what it seems. I was drawn into this book and enjoyed the twists that it took. Daunes writing is simply beautiful and has almost a lyrical quality to it. Every realm was marvellously done and reading this book was like stepping into the worlds she had created. What was also wonderfully unique was she didn't just touch on one thing, she tired Mermaids, Sirens, Shifters and so much magick. What was wonderful is that all of these elements seemed to flow together seamlessly, and it was like they were meant to be and just no one noticed until this talented Indie. Basically the world building was simply delicious and made it so much easier to devour. Halen was seriously kept in the dark her entire life... Not that she didn't recognize that there was something different about herself. You can't hear everything around you and unleash fire and other elements beyond your control and not notice. I felt for her and the fact that she was always only getting half truths and half stories, everyone claiming she would know when she needed to. What I also liked was that she grew. She was not a character that stood still, but she also had the sense to not jump into what everyone claimed she was meant to be. Heck, she was terrified and didn't feel that she could do it, but you don't find out that you have some epic fate that could kill you and those you care about without hesitation. However, when the other option was so much worse, she held her head high and prepared for what lay ahead of her. I also loved the slew of quirky characters. Yes, Halen was the start but it was all of the little pieces that made things interesting. There was many elements at work, at any given time during this book and each moment carried someone that fit. Now these elements did meld and had a point to them but it was amazing to watch everything come together. My favourite of all of them was probably Tage. She was wonderfully snarky and even though she held things back, she didn't want to. I could also appreciate that she never pretended to be something she wasn't. She wasn't a warm cuddly person, but she did care deeply about what happened, even if it was for her own reasons. For love Daune kept it to a minimum. There was for sure a connection with Halen and Dax bt it was very hot and cold. At first I was beyond frustrated, but then I started to put things together and a lot more made sense. This isn't to say that he did not irritate me, and I didn't want to yell at him at times. However, he was what he was and there was reasons for it. Dax was distant for most of the book when it came to Halen but as just a character I did enjoy him. He seems torn about so much and he has so many secrets that he has to keep in order to follow through with what he is supposed to do. I wish that things could have been more simple for him, but then it wuldn't have been the story that I fell in love with. 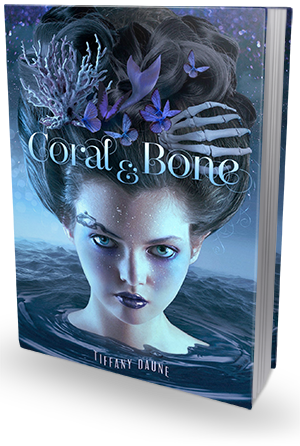 Coral & Bone is not like anything I have read before. It is a beautiful cross of fantasy, paranormal and its own unique mythology. Tiffany Daune nailed this book and I am excited to see what happens next! There is a bit of a cliff hanger at the end but it isn't the kind that makes you want to scream and hurl the books across the room while screaming and pulling on your hair. I highly suggest this book for lovers of any of the genres specified above or if you are looking for a diverse book, with writing that will draw you in until the last page!! 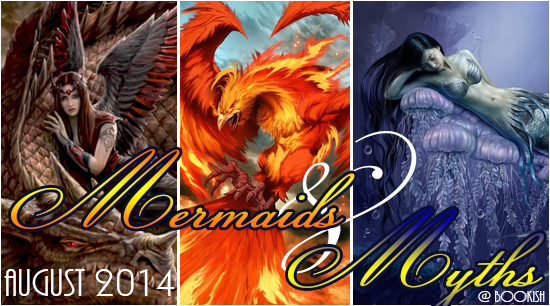 Yes, I write about evil mermaids, but I'm still a huge fan of the Little Mermaid. Either way it would rock to have fins even if I did have to give up my shoe collection. Besides, who wouldn't want to hang out with dolphins, carry a tune underwater, and vacation off the coast of France? I could say goodbye to salon appointments because we all know mermaids have naturally gorgeous locks. In my free time I could spin some magick and clean up the oceans. Yes, being a mermaid would rock indeed as long as I could take a stack of books.